We are currently recruiting for two positions of Treasurer and Legal Advice. Young Women’s Leadership Network (YWLN) is a not-for-profit organization dedicated to fostering young women’s leadership capacity in civic engagement and politics. We work from a non-partisan, anti-oppressive, trans-inclusive, intersectional feminist perspective. Our organization serves young Millennial and Gen Z women on their journeys toward civic and political leadership through age-specific and targeted programming. 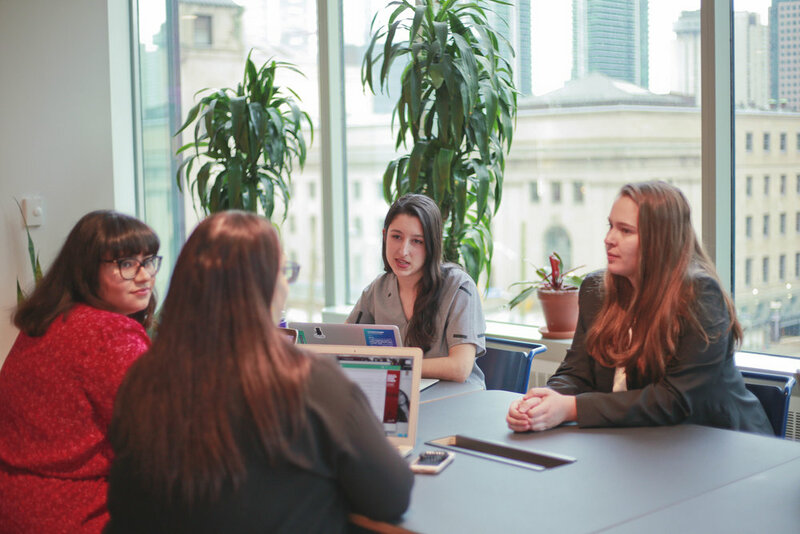 We work with various community groups, not-for-profit organizations, and government partners to address and transcend systemic barriers impacting young women's civic and political leadership. YWLN uses equitable hiring practices that prioritize the leadership of marginalized women. We encourage Black, Indigenous, Women of Colour, women with disabilities, queer women, women from low-income backgrounds, as well as refugee & immigrant women to apply. *We use an inclusive definition of “woman” and we welcome trans women, genderqueer, non-binary and gender expansive folks. We recognize that gender is an evolving concept and we will work to be inclusive of those identifying across the gender spectrum. Applications from outside Ontario are welcome. Please send a copy of your resume and letter of interest to admin@ywln.ca by Wednesday, May 1, 2019 at 11:59 p.m. EST. Time Commitment: Attend quarterly meetings and other meetings as necessary either in person or via video/audio call. 4-5 hours a month volunteering for the organization. Participate in at least one of the following working committees: Governance, Development and Finance, or Strategic Planning. This is a ‘working board’ opportunity. We are looking for someone interested in making a meaningful contribution to the organization. Demonstrate dedication toward empowering young women’s civic and political leadership and young women’s success in other fields such as STEM and the arts. Past board or governance experience an asset. Please send your resume and letter of interest to admin@ywln.ca by Wednesday, May 1, 2019 at 5 p.m. EST. Time Commitment: Attend quarterly meetings and other meetings as necessary either in person or via video/audio call. 5-10 hours a month to fulfill Treasurer responsibilities. This is a ‘working board’ opportunity. We are looking for someone interested in making a meaningful contribution to the organization. The Treasurer opportunity requires a close working relationship with YWLN’s Executive Director. Who demonstrate dedication toward empowering young women’s civic and political leadership and young women’s success in other fields such as STEM and the arts.